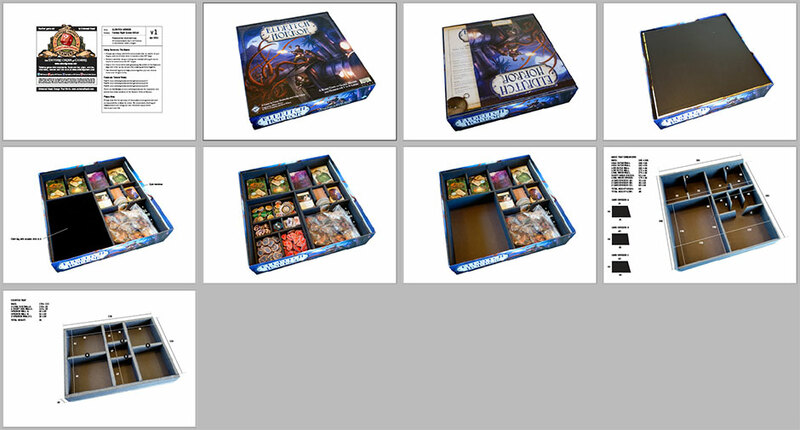 Keep the Old Ones at bay with this Eldritch Horror foamcore box insert plan. Fantasy Flight Games—you make great games, I have many, many of them in my collection, but why, oh why, have you never made box inserts (with the sole exception, I believe, of Fury of Dracula, for some inexplicable reason)? I’m sure they’d insist you get more stuff in the box because you’re not paying for one, but I fear my healthy cynicism counters that the money saved goes to them rather than us. It certainly keeps me busy making foamcore box insert plans. And here’s another, this time for Eldritch Horror. This design does assume that you’ll buy a nice bag to put your monster chits in, but I’m sure you’ll agree that’s a purchase worth making. Just a little off-topic tidbit: if you’re a fan of the works of H. P. Lovecraft, I highly recommend the H. P. Podcraft Literary Podcast. It’s a professional, insightful, informative and often surprisingly funny podcast that is definitely worth listening to, made by some of the guys involved with the brilliant H. P. Lovecraft Historical Society. But FFG does pad out the box space with their folded cardboard inserts – probably just to stop stuff rattling around too much during shipping. Will any of the expansions fit ? Could Forsaken Lore (damn snakes) fit only being a small box & boardless. I think the Mountains of Madness box would allow more capacity for some future expansions. Forsaken Lore wil fit, but as usual, this isn’t designed for expansions as I can’t predict how many they’ll be or what will be in them. Too true you never know if FFG will unleash an Arkham Horror of expansions or simply drop the game. I do suspect they did keep the initial numbers of GOOs and investigators down so they could keep interest bubbling in the game by releasing more in the future expansions. From the photo it looks the same. It should be 5mm thick and foam sandwiched between two thin cardboard layers. It comes in black, which I prefer. I get it from art supply stores. Used your foam core plans for the main tray, but didn’t do the counter tray as I wanted to get as much stuff in there as possible, so the counters are bagged. Managed to get Forsaken Lore and Mountains and Madness in, but the not the side board for Mountains. The side boards are a problem, so I’m thinking of scanning Antartica map, then printing on thin card so that I can slip it inside the box. I know it won’t be as nice, but it gets more in the box.